ROAD TRIP Somm Enchanted Wine Journey JONATHAN MITCHELL, ASSISTANT GM AND BEVERAGE MANAGER AT THE PALM IN LOS ANGELES, REPORTS ON HIS SONOMA STOP-OVER photo by Tina Chao S onoma Wine Country is the home of some of the best Pinot Noir and Chardonnay on the planet, and has always been “the other wine destination” for those seeking to avoid the crowds in Napa, but now more and more of us are realizing the true charm of this easy to-get-to jewel. I only had two days for a getaway, and with Horizon Airlines now fl ying right into the heart of wine country, “popping in” couldn’t be easier and more affordable. First stop, Iron Horse, where they are not only making ten amazing sparkling wines, but also six Chardonnays and four Pinot Noirs. The Sterling family has also become known for their commitment to the environment. When you buy a bottle of their Ocean Reserve Sparkling Wine, they donate $4 to establish protected marine areas, in partnership with The National Geographic Society. Up the road a tad, I stopped in to visit Shane Finley, winemaker at Kosta Browne, who is pushing the envelope in the world of Pinot Noir. Shane took me through barrel after barrel of Pinots that were amaz- ingly opulent, intense, well-structured and consistent. These wines are not for the faint of heart. Next on the agenda, Jordan, one of the most beautiful wineries in Sonoma. In 1972, Tom Jordan set out to build the most perfect Bordeaux-inspired winery he could, settling on this gorgeous spot in Alexander Valley. Winemaker Rob Davis has been with him since 1976, taking over the helm from André Tchelistcheff, and still turns out top-notch iconic Cabernet Sauvignon today. We also had the fortune of trying their crisp, Burgundian Chardonnay and even their homemade extra-virgin olive oil. After vineyard tours, it was time to explore Sonoma Town Square. There is no shortage of great restaurants here, including Cyrus, Ravenous, Zin, Willi’s Seafood Bar, Rustic and Charlie Palmer’s Dry Creek Kitchen. I was craving seafood so went with tapas-style small plates of seafood at Willi’s, then stopped for after-dinner drinks at Dry Creek Kitchen. 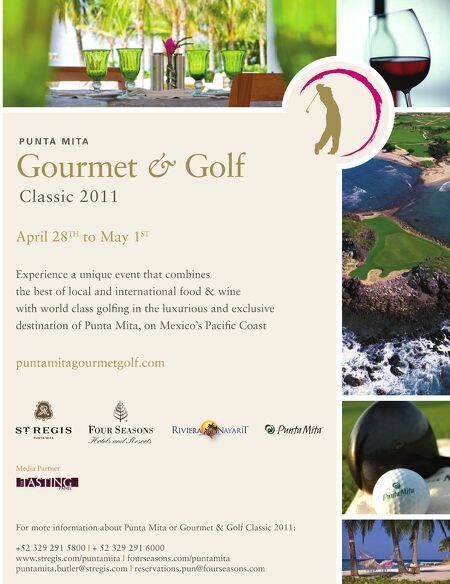 Great wines by the glass and top-notch mixology were in no short supply here! But I kept it an early night as there was an early morning agenda for more wine tasting. Our second day started with a visit to Cline Cellars, where winemaker Charlie Tsegeletos is making more than 114 / the tasting panel / april 201 1 17 different wines—an impressive lineup of Zins, Syrahs, Mourvèdres, Carignanes, Viogniers, Marsannes and Pinot Gris. What a great way to start the day! It was an incredibly beautiful and windy drive up to Kenwood on this frost-covered morning. It was my fi rst trip to Chateau St Jean, a meticulously maintained 250- acre estate built in 1920. 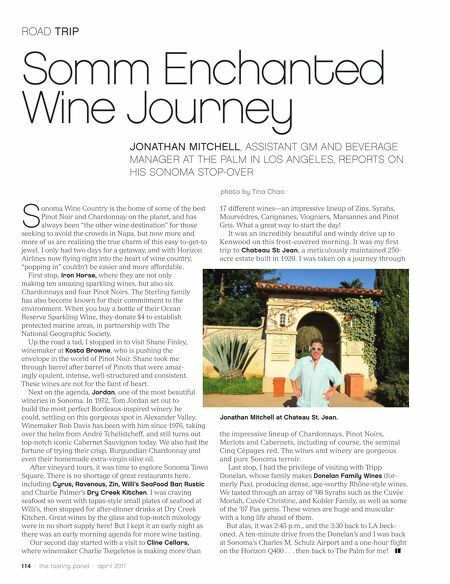 I was taken on a journey through Jonathan Mitchell at Chateau St. Jean. the impressive lineup of Chardonnays, Pinot Noirs, Merlots and Cabernets, including of course, the seminal Cinq Cépages red. The wines and winery are gorgeous and pure Sonoma terroir. Last stop, I had the privilege of visiting with Tripp Donelan, whose family makes Donelan Family Wines (for- merly Pax), producing dense, age-worthy Rhône-style wines. We tasted through an array of ’08 Syrahs such as the Cuvée Moriah, Cuvée Christine, and Kobler Family, as well as some of the ’07 Pax gems. These wines are huge and muscular with a long life ahead of them. But alas, it was 2:45 p.m., and the 3:30 back to LA beck- oned. A ten-minute drive from the Donelan’s and I was back at Sonoma’s Charles M. Schulz Airport and a one-hour fl ight on the Horizon Q400 . . . then back to The Palm for me!